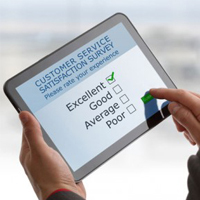 1) Solutions that focus on gauging customer satisfaction, primarily to improve operations and, ultimately, revenue. 2) Solutions that focus on getting testimonials posted on web sites. 3) Utilizing surveys to immediately increase sales conversion rates and train sales staff on what matters most to customers during the sales process. In this case study, Client B’s actions resulted in a 32% better close rate than Client A’s. The key is to apply “intelligent intervention” – in other words, the right response to the right customer – to optimize your sales conversions. Consider these two client businesses – Client A and Client B. Both in the same segment – elective medical. One a national company with locations across the country; the other a strong regional player. In similar metropolitan markets. Both with centralized marketing clout and branding. Both with similar service offerings. During this case study period, both reported appointment-to-sale conversion rates ranging from 45% - 60%. This was during 2007, and those numbers are still pretty standard today for their segment. Objective 1) Determine why prospects were purchasing (or why not). Objective 2) Try to use that knowledge to close more sales. But they took slightly different approaches. Client A instituted xAmplifier’s survey instruments, capturing customer feedback about their experiences and their decision drivers. This gave corporate staff great insight for making product and marketing choices, and provided better insight into the field staffs’ performances by location. Client B took the same approach, but with one key difference – they also integrated a “Sales Save” follow-up plan, utilizing xAmplifier’s consultation survey Alerts. Basically, this means analyzing where a customer is in the decision process, then sending immediate Alerts to field staff with insight into the best next steps. NO, POSTPONE: Customers who did not plan to go through with the purchase. An important lesson from the YES subset ---> even if a customer reports an intent to purchase from you, that’s no guarantee that he or she will. If you’re not converting customers who tell you they intend to purchase, then you’re missing obvious revenue opportunities! In Client A’s case, fewer than 70% of those who intended to purchase – the YES respondents – eventually did purchase from Client A (67.6%). Using the Alerts system to track the “low hanging fruit,” Client B’s actual close rate from their YES group was better – 80.0%. And a corollary lesson from the NO subsets ---> even if a customer reports an intent NOT to purchase from you, you still have a chance. So, for instance, even with no active intervention, Client A saw some eventual purchases from their NO subsets – 8.2% of those who reported intent to go to another provider, 15.0% of those who simply planned to postpone. With “intelligent intervention” using the Alerts system, Client B’s numbers with the NO subsets were impressive – eventual purchases from 57.5% of those who’d reported a preference for another provider, and 41.2% who’d previously leaned toward postponing. Of course, once your staff knows the customer’s specific purchase (or non-purchase) drivers, they still need to proceed intelligently. Responses can be tailored. So, for instance, in Client B’s case, if the customer reported being uncomfortable with the consultant (or even the doctor), Client B had a different consultant call back the prospect. If the customer suggested a concern about procedure risk, the consultant responded with additional safety or experience information, or even offered a test procedure. Because Client B was in an aggressive growth period, if the customer suggested price issues, the consultant was provided some leeway in offering promotional specials. We started by outlining 3 different key objectives for survey-based programs. Our xAmplifierTM software does an extraordinary job for all 3 of these. It incorporates Net Promoter Scoring1 (NPS) approaches and over a decade of purchase decision correlations to help businesses optimize their Customer Experience. It also identifies your more influential respondents, whose content can help trend your content and drive your social media. And, for many businesses facing competitive budget environments, its Alert system approach helps your team convert more business… starting today.